Well, let me explain. We have 11 more days to go before Shaban. Rather than dreaming about how you’re going to be worshipping Allah in Ramadan, start worshipping Allah in the remaining days of Shaban. You don’t know if you’ll reach Ramadan. Also, instead of dreaming about the last 10 days of Ramadan, first focus on the first 20 days. Also, instead of dreaming about how you will make a change in your life one day, start making a change today even if it’s a small step. All I’m saying is this: Do things steps by step and don’t count your chickens before they’re hatched. I remember something my professor said about the average Muslim today. He said that the whole year round, they never pay any attention to the Quran, but when Ramadan comes, they want to finish the whole thing in a month! Subhan Allah, he hit the nail on the head. 1) Ultimately, what is the difference between Ramadan and the other 11 months? We need to please Allah in Ramadan and we also need to please Him in the other 11 months. 2) Why does the Quran take on such importance in Ramadan? People will say that this is the sunnah, that the Prophet (salallahu alaihi wasallam) paid more attention to it. Yes, he paid MORE attention to it but he didn’t just pay attention to it in Ramadan. His wife, Aisha, was asked about his character. What was her reply? So, the Prophet (salallahu alaihi wasallam) saw the Quran as something that needed to be applied – not just part of it but all of it. 3) Why are we being so pious in Ramadan? Is it because we want to please Allah? Or is it because we see everybody doing it, so we follow along? 4) How do we start spending time with the Quran? Well, start small. It’s okay, at least something is better than nothing. If you currently read 0 ayaat (verses) a day, then try to spend 5 minutes a day on the Quran (and make sure that you DO NOT sleep until you do this). Read the Quran every day without fail. Then you can gradually increase the amount that you read. For those of you who don’t understand Arabic, PLEASE read it with a translation. Can you listen to the Quran? Yes, but it won’t fulfill your obligation of having to read the Quran. Do you have to finish the Quran in Ramadan? No, it is recommended but not mandatory. For those of you who barely read the Quran outside Ramadan, I think it’s better if you do not make this your goal. Rather, it would be better if you try to attempt to be regular so that you can continue reading the Quran daily after Ramadan. Perhaps you could focus on a few ajzaa (parts) along with the translation and some tafsir (explanation). Of course, if you have the ability to read and understand more, then be sure to do more. I also advise all of you to keep a Quran journal. What’s that, you ask? For now, I’ll leave you with this nice treatise written by Shaikh Ibn Baz (rahimahullah): An Incitation Towards Being Especially Attentive and Being Diligent on the Book of Allah and Learning it. Yes, indeed. This is something we all need to work on, myself included. 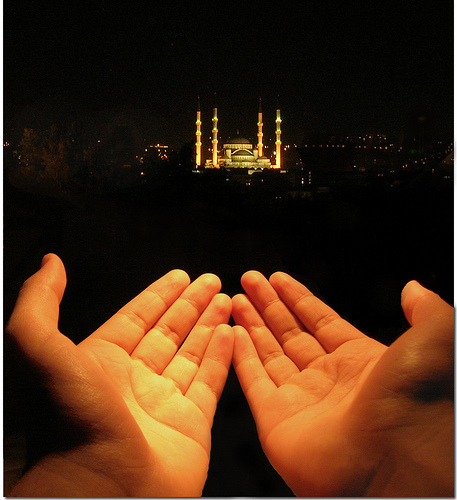 Ramadan is a month of prayer: the taraweeh and the qiyam al-layl come to mind. We always dream of praying more in this month. Therefore, we need to prepare ourselves in advance. Firstly, what is the point of praying? It’s done to get closer to Allah, to know Him, to establish a connection with Him, to praise Him and to glorify Him. Salaah is the primary application of tawheed. It isn’t done just to get it over with. 1) The outward actions – these have to be done the way the Prophet (salallahu alaihi wasallam) did it, not the way that we were taught by our parents, teachers, in-laws, etc. Of course, it’s quite possible that our parents or teachers taught us how to pray the right way. If so, then alhamdulillah. If not, then we need to leave the wrong way and learn the right way. 2) The inward actions – This is the action of the heart and that’s where the seat of khushoo (humility) is. This is what we would call “focusing on our salaah”. Insha-Allah, in future posts, I’ll be putting up resources on how to pray properly as well as khushoo tips. The first is the level of the one who wrongs himself and is negligent. He does not do wudoo properly, or pray at the right time or make sure he does all the necessary parts of prayer. The second is one who observes the outward essentials of prayer, prays on time and does wudoo, but he has lost the battle against his own self and is overwhelmed with waswaas. The third is one who observes the outward essentials of prayer, prays on time and does wudoo, and also strives against his own self and against waswaas, but he is preoccupied with his struggle against his enemy (i.e. the Shaytaan), lest he steal from his prayer, so he is engaged in salaah and jihaad at the same time. The first type is punishable; the second is accountable; the third is striving so he is not counted as a sinner; the fourth is rewarded and the fifth is drawn close to his Lord, because he is one of those for whom prayer is a source of joy. Whoever finds their joy in prayer in this life, will find their joy in being close to Allaah in the Hereafter, and will also find his joy in Allaah in this world. Whoever finds his joy in Allaah will be content with everything, and whoever does not find his joy in Allaah, will be destroyed by his feelings of grief and regret for worldly matters.” (al-Waabil al-Sayib, p. 40). Err, do dua for what, you ask? Ask Allah to enable you to reach Ramadan, of course, because we don’t know if we’ll make it this year or not. The Salaf (early generations) used to ask for this SIX months in advance!